Welcome to The Swinging Bridge Restaurant! Celebrating over 10 years of bringing you homestyle good cookin’ with a Southern gourmet flare. What! You haven’t tried us yet? Our unique dining experience is well worth the drive over the mountains and through the woods. The Swinging Bridge offers a cozy setting in front of a raging fire (seasonal, of course! ), with décor that reflects the beauty and splendor of nature, brought indoors. Sit down, relax, and have something good to eat! Our Menu features a variety of buffalo dishes, as well as delicious, mouth-watering BBQ ribs and chicken, perfectly prepared on our own locomotive smoker. For the traditionalists, we have Sunday Dinner - Pan Fried Chicken - and many other family favorites, like our Blue Plate Specials (Fridays) and Prime Rib Saturdays. When the weather is fine, you can dine on our screened-in back porch that overlooks historic [Tingler’s Mill]. The Big Wheel’s turnin’ and the mill is open for visitors. If there is a short wait for your table, enjoy some outdoor game time with horseshoes or corn hole, and work up your appetite! On most Thursday nights during High Season, local musicians play great country and bluegrass music for your entertainment. After your meal, go upstairs to stroll across our real swinging bridge, check out our wildlife display and visit the Paint Bank General Store & Gift Shop. Reservations for 8 or more can be made by calling ahead — (540) 897-5099. Larger parties: certain restrictions apply, call for information. Reservations for 8 or more can be made by calling ahead. Larger parties: certain restrictions apply, call for information. Omelets made with 3 farm-fresh eggs. All eggs & omelets served with Fried Taters & Onions, Country Bread Toast, Biscuit or Thomas’ English Muffin. A mix of spring lettuces, baby spinach with cucumber, tomato wedges & homemade croutons. Deep fried hoagie roll, loaded with homemade chicken salad, lettuce, tomato, bacon, topped with cranberry sauce – a real taste treat! Served on a homemade Kaiser roll over dill-icious mayonnaise, lettuce & tomato, topped with deep-fried dill pickle chips. All White Meat, served on a bed of lettuce, with tomato wedges, sliced hard-boiled egg & crackers. All Entrées (except Grilled Vegetable Platter) served with Choice of Mashed Potatoes, Baked Potato, Sweet Tater Fries (add .50) or French Fries, and Choice of Dinner Salad or One additional Side Dish of the day. $19.95 8 oz. / $21.95 10 oz. 10 oz of prime aged Angus beef, seasoned to perfection, cooked to order, served with our signature horseradish sauce and a choice of two sides. We're here to answer your questions or help point you in the right direction. Just leave us a message! The Swinging Bridge Restaurant is located on the left. 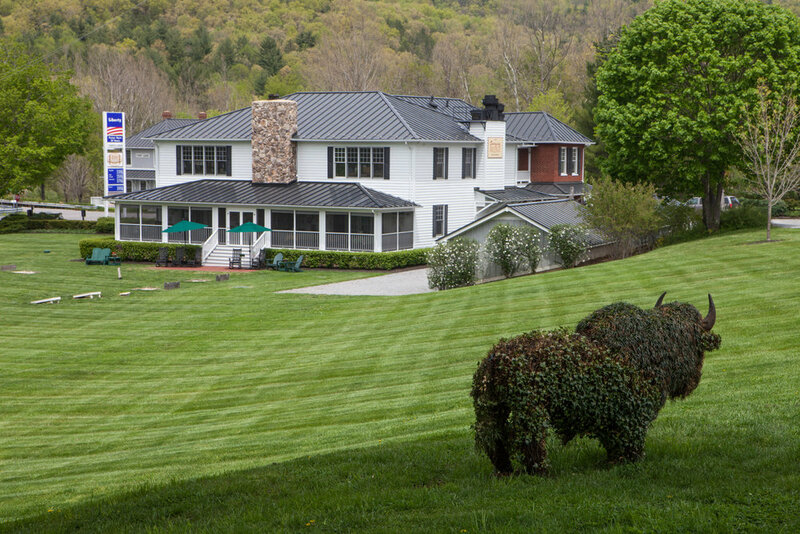 The Swinging Bridge Restaurant is just one of our many attractions here in Paint Bank, VA. Looking to spend the night, hunt or fish, or shop at an old fashioned general store? Come see us!